Not surprising Georgia's transportation bill (t-splost) was defeated in most of the regions on Tuesday. What was surprising though was by how much it was defeated in some regions. For example, for the Atlanta metro region (Region 3), 37% voted in favor, 63% voted against. A bit closer in the Savannah area (Region 12) with 42% voting in favor and 58% voting against. (I-16 area which connects Savannah to Macon). Now it's back to the drawing board for Plan B - although we as voters were told throughout this campaign this was an all or nothing deal and that there was no Plan B. Well, apparantly there is one - one in which our Governor, will now prioritze projects such as the 285-GA North400 interchange (I'm personally happy about this one as I usually say a prayer or two before stepping on the gas to merge onto the GA400 Speedway) instead of revisiting another 1 cent tax to pay for all the needed projects. What about MARTA, our troubled public transportation system? Fulton and Dekalb counties are already supporting it through a separate one cent sales tax but problems continue. What is its future? That has yet to be discussed. For the Atlanta metro region and based on all the commercials voters had to endure throughout the campaign, if traffic is indeed such a concern for the proponents of this bill, perhaps it's time for the rest of the counties in the Atlanta metro area to finally vote to support it. Or at least try to fix MARTA. Not only did the Atlanta metro region defeat this bill but Savannah did as well. Savannah, as in the location of one of the largest ports in the US. If you ever have been on I-95 around this area, again, prayers are needed as one tries to maneuver throughout the maze of trucks up and down the interstate and around the port itself. Good news though, for truck drivers that are heading towards Macon, I-16 should be a breeze thanks to the passage of the bill in that region. Bad news is once you are in Macon, well good luck, they didn't pass it. Believe me, Macon isn't a piece of cake to get through either - paticularly as more and more distribution centers relocate to this area - it will become even more difficult over time. 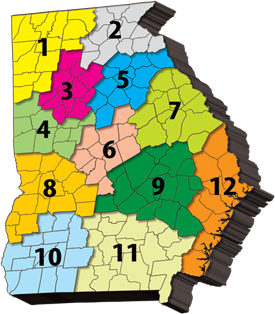 Other growth spots for distribution centers - Region 5, Northeast Georgia, encompasses I-85 which goes into the fast growing Greenville/Spartanburg SC and Charlotte NC areas did not pass the bill. Region 4, Three Rivers encompasses I-20 which goes into Alabama did not pass the bill either. Clearly another plan is needed - again, one in which the state government (Georgia Department of Transportation perhaps?) takes charge, formulates a state-wide plan and implements it fairly and within budget. A one cent sales tax is not the answer - how can you budget for transportation improvements when you are dependent on consumer spending? Funding must be fair to all and across the board not on the basis of regions. If the government is intent in adding a one cent sales tax - add it to the state sales tax not the individual county sales tax. Or perhaps other creative means of funding can be found? Maybe it is time for a national transportation plan - one in which the federal government identifies, prioritize and funds such projects? As is the case now, we have 3 regions that have approved the bill and thus will result in a patchwork approach towards transportation improvements - similar to the days in Europe when each country managed their own rail system which resulted in many times folks switching railroads at country borders because of differences in gauge. The headlines in the local paper state this is a victory for the local tea party. I don't see it as a victory for anyone, instead I see it as a failure to come up with a logical plan to improve the infrastructure of this state. From a logistics stand point, the state of Georgia has so much potential - a fantastic port, a growing international airport, a network of Class I rail and road interstates that connects the state to most of the US - it's a great place to locate businesses. We'll see what happens in two years when the measure is allowed to come up for vote again.